Founded in 2002 in Taiwan, O’right entered the market as a professional hair care brand that develops, produces, and distributes a series of natural, pure and eco-friendly products. The company is committed to being forward thinking and eco-friendly by reducing their carbon emissions and being the first hair care company to be certified as “Carbon Neutral” under PAS2060; using ECOCERT, USDA organic and the most natural ingredients; printing with soy ink on their packaging and utilizing recycled materials wherever possible. Both SGS and RoHS have certified all product packaging as non-toxic. With the brand vision of “Everything is all right”, O’right devotes itself to develop “Green Products” and dedicate to charity activities for environmental protection to ensure our future generations a sustainable good life. Use natural & ECOCERT organic ingredients: Does not cause environmental hormones but leaves an unpolluted environment to aquatic. Use Soy Ink printing: Non-heavy metal, non-toxic, non-irritating smell and non-pollution. Use biodegradable as well as recyclable bottles: Upgraded the recycling stream from Technical Metabolism to Biological Metabolism. Eco-carton with Green Mark: 80% made of recycled paper. Eco product label: Safe and non-toxic sticker with eco printing, which complies with SGS and RoHS standards. Use airbags to protect our goods while shipping: Reusable and recyclable. Barcode systems: Each product is given two barcodes, complete traceability system to ensure quality control. Green Design: Developed 10L, 5L Eco-Packages and 1L refill pack to save 120,000 pcs of 400ml plastic bottle yearly. FREN Eco-Handbag: 100% Polypropylene Fiber, degradable without pollution. The unique award-winning “Tree in a bottle” is solely developed, designed and produced by O’right. This internationally patented 100% PLA (polylactide) shampoo bottle will biodegrade into a high-nutrient fertilizer to nurture seeds in the bottle to grow a tree. 100% Biodegradable Materials: The most eco-friendly materials; made from PLA which are extracted from waste fruits, vegetables and plants. 100% Tree Seeds: First invented to embed seeds in a shampoo bottle. 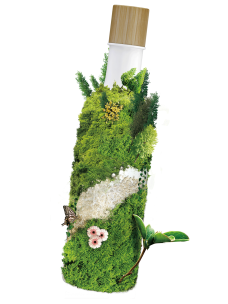 The bottle will biodegrade into CO2 and H2O as nutrients for the seeds.